I had a problem. I sold my house about a month ago (which is good in this market) but hadn’t found a place to buy. Taking the raw MLS results and using online mapping tools to see relationships between houses/schools/roads/airports/railroads/etc is harder than it should be. First off I figured I’d just do it all in Google Earth and KML. This lasted about a day as Google’s (and Microsoft too) geocoding is less than desired in the area’s of Tempe I was looking at (at times hundreds of yards off). So I ended up using a couple of tools to research the locations before visiting on the ground (with 45,000 homes for sale in Maricopa County, you need to eliminate choices before visiting them). First off the MLS site that my real estate agent uses is pretty good. I’ve not been able to figure out the company that makes the site, but Steve’s site runs on HomeQuest which is visually a cross between Mapquest and Google Maps. It has a quick AJAX interface that makes it easy to see the general location of a property and the neighborhood it is in (the neighborhood boundaries were very helpful). The problem is you can’t tell what side of the road it is on and it doesn’t have aerial imagery. Putting the address into Google Maps gives you a nice overview of the house. The problem is that it makes it hard to share multiple locations (pasting 10 permalinks in an email is a non-starter). I tried to work with KML, but that was just an extra step I didn’t want. but it still doesn’t give you a feeling of the location of the house that you’d like before you spend an afternoon there only to see it is next to a Walmart. The work around for me was to use Zillow. Zillow has a much better address search and you can see the parcels to get a better understanding of the particular house. 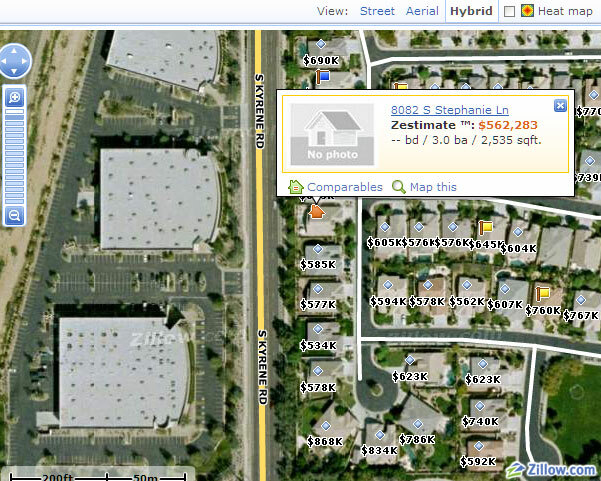 Now the Zillow aerial is not as nice as Google’s, but they do have the Bird’s Eye view so I decided to click on that. Sorry, we do not have images available for this location, but check out our Bird’s Eye View of Famous Homes. OK so that doesn’t work. 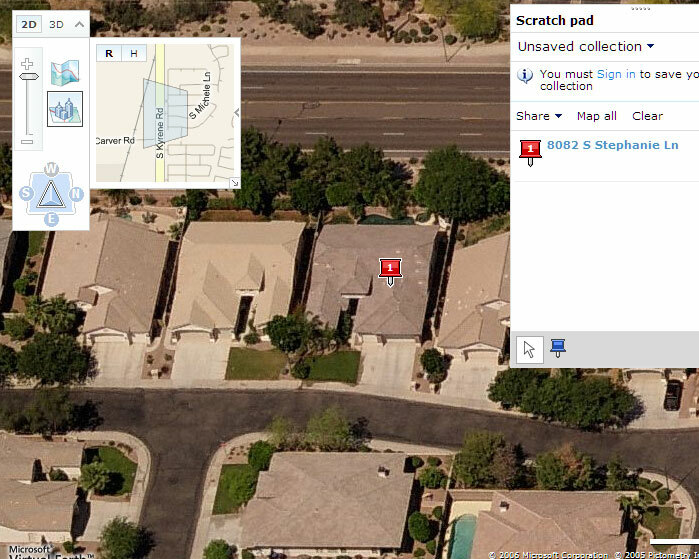 I know Microsoft Virtual Earth has Bird’s Eye View for Tempe, so off to another site. As I said above, Virtual Earth and Google are both off a little bit on the geocoding (not a big deal for directions, but important when looking at a house) so I used Zillow to pinpoint the house and pan the Bird’s Eye View. So I can see the yard, the neighbors, the big road in the backyard, the railroad now the street and the power plant 1/4mile away (all without having to visit). The best part about Virtual Earth was that I could add multiple listings to my scratch pad and then share that with my wife, her mom (very important) and friends. KML would have been too much of a hassle and it doesn’t offer the Bird’s Eye View that is so valuable. Now if Zillow had updated their Bird’s Eye since the first introduced it, I might have never bothered with Virtual Earth, but the Zillow/VE combo was just killer in finding the house I wanted in the location I wanted. I figured I’d be using Google Earth for this exercise, but Virtual Earth’s scratch pad is so valuable with sharing multiple points of interest that I never even bothered with Google’s products. 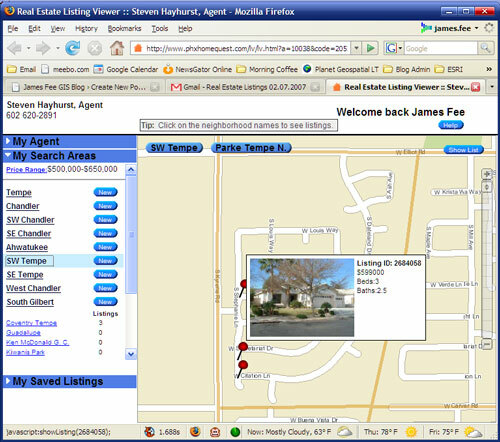 What about Realtor.com and ESRI’s ArcWeb interface? Well Realtor.com was very slow. Even getting to the map took WAY TOO MANY CLICKS and I’d just give up. The map was nice, but it too was stuck in that horrible slow interface. 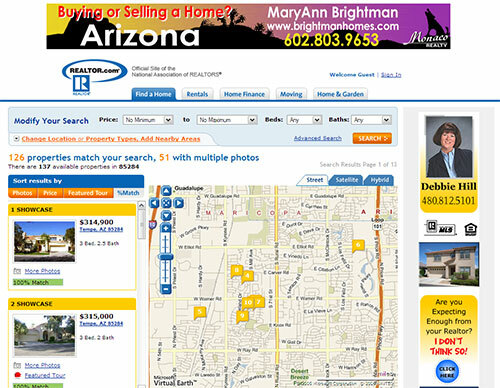 Compared the my realtor’s site and the Zillow/VE combo it was just too much of a pain to deal with. So I found my house and I close end of March. The only problem is I have to live in an apartment for that time between February 14th (when I close on my current house) and March 28th when I close on the new house. I can’t wait for the fun that will be. ;) At least that will give me time to fix Planet Geospatial (yea I’m a bad person for letting that fall apart) and build a 3D model of my new house in SketchUp.